Have you heard about #RavenPeopleRising, PAOV? The Heiltsuk Nation punches above its weight. In 2016, the tiny Bella Bella, BC community stood up to Enbridge— one of the biggest oil companies on Earth — and won. Their successful legal challenge, backed by thousands of supporters like you through the Pull Together campaign — has kept tankers and pipelines from overrunning BC's north + central coast. Just last week, the Heiltsuk intervened in support of British Columbia’s push to claim jurisdictional control over the shipping of dangerous fuels on our coast. Every single person who loves the Pacific coast, orcas, wild rainforests and strong communities owes a debt to the Heiltsuk, who have stood up again and again, for all of us. Now there's a way we can give back to the Heiltusk Nation and put reconciliation into action for Indigenous coast protectors. In the wake of the disastrous Nathan E. Stewart oil spill, the Heiltsuk are back in court, this time challenging Canada’s so-called ‘world class oil spill regime’ and pressing for Aboriginal title to the foreshore and seabed so they can assert their sovereignty to regulate things like marine shipping, fisheries practices and environmental assessments. 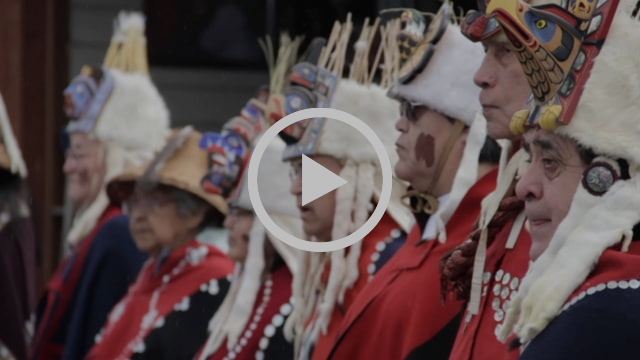 The Heiltsuk's vision for their territory is laid out in “Raven People Rising”, a new short documentary we made here at RAVEN. The film captures the power and passion of the community, which is taking extraordinary action to revitalize Indigenous laws and stewardship practices. "Raven People Rising" portrays visionary young Heiltsuk leaders who are boldly standing up to government and big corporations and tackling forces that threaten our water, the climate and the Great Bear Rainforest. Sign up here to be part of the People's Premiere of "Raven People Rising". Whether it's a gathering of friends in your living room or a screening in a hall, pub or church, we are offering this film to anyone who wants to bring people together to donate, fundraise, and organize events in support of the Heiltsuk Nation's legal challenge. Join in launching Raven People Rising: host a screening for the People's Premiere. Look for Screenings in Terrace, Prince Rupert, Tofino, Haida Gwaii, Friday Harbour, Victoria and Salt Spring Island. The People's Premiere of #RavenPeopleRising kicks off RAVEN's online fundraising campaign for the Heiltsuk legal challenge. By inviting people to donate and set up online fundraisers, we aim to raise $425,000 and build the strongest case possible for ocean protection. We are using the same winning strategy that stopped Enbridge and has put the brakes on the KinderMorgan/TransMountain project. Join a movement of people who are donating, fundraising online, and organizing film screenings to raise the funds the Heiltsuk need to take on Canada, BC, and the Texas oil company who spilled diesel into the breadbasket of this coastal Nation. A win for the Heiltsuk could toughen oil spill regulations along the whole Pacific coast and strengthen First Nations jurisdiction so that territory can be managed according to Indigenous laws. Help grow our movement’s mighty force: organize your own screening, create an online fundraiser, and spread the word so the Heiltsuk's powerful voices can be amplified across the country and around the world. p.s. During the month of May, we aim to have 50 new people sign up to host screenings as part of the People's Premiere: sign up to be a host today!